An Emberall album is the perfect gift or keepsake for your loved ones. By buying the DVD and USB, you'll be able to share and preserve the memories recorded in this interview in a compelling way. 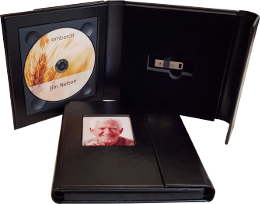 Your DVD/USB will arrive in a premium faux-leather case with high-quality packaging, perfect for gifting or saving. On the DVD, you'll be able to watch the interview straight through, or jump directly to a question of interest. Buy your Emberall DVD/USB today — your memories are worth it.